Spain: Day 36 of 985 of the Spanish Civil War. Spain: Day 401 of 985 of the Spanish Civil War. CBI - China: Day 46 of 2,987 of the 2nd Sino-Japanese War. Day 9 of 106 of the 2nd Battle of Shanghai. Spain: Day 766 of 985 of the Spanish Civil War. CBI - China: Day 411 of 2,987 of the 2nd Sino-Japanese War. Day 72 of 139 of the Battle of Wuhan. Japanese troops capture Luoshan and Xinzi. Germany: Hitler reads a telegram from Stalin, acknowledging their agreement on a non-aggression pact. Hitler responds by banging his fist on the table exclaiming, "I have them! I have them!" Shortly afterward Berlin radio announces that Germany and Russia have concluded a treaty of non-aggression which will be formally signed in two days. 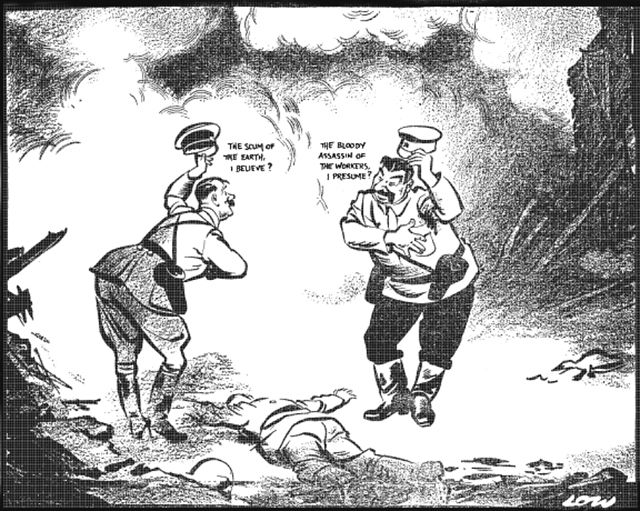 British cartoon published in the Evening Standard on 20 September 1939 shows Hitler greeting Stalin, following their joint invasion of Poland, with the words, "The scum of the earth, I believe?" to which Stalin replies, "The bloody assassin of the workers, I presume?" The non-aggression pact was signed in Moscow in the late hours of 23 Aug 39. The British government had know about the Nazi-Soviet negotiations since the beginning of August but the Pact came as a complete surprise to the British public, who found it hard to believe that communist, Hitler-hating Russia had made an alliance with Nazi, Communist-hating Germany. They judged, correctly, that the Pact was a cynical lie to devour Poland, which Hitler was now freed up to do, knowing that Britain and France could not do anything to defend Poland. This also ended Britain's hopes of an alliance with Russia to stop Hitler. People now realized that nothing but war could stop Hitler. Although many were lulled into a false sense of security by this pact, most saw it as yet another ploy by Hitler, the opportunist and a trickster who could never be trusted. The pact was known as the Molotov-Ribbentrop Pact, named after the Soviet foreign minister Vyacheslav Molotov and the Nazi German foreign minister Joachim von Ribbentrop. It was officially the Treaty of Non-aggression between Germany and the Union of Soviet Socialist Republics and was also known as the Ribbentrop-Molotov Pact or the Nazi-Soviet Pact. Regardless of the name, the pact remained in effect until 22 June 1941, when Germany invaded the Soviet Union. CBI - China: Day 776 of 2,987 of the 2nd Sino-Japanese War. CBI - Mongolia: Day 103 of 129 of the Battle of Khalkhin Gol, a border dispute between the Soviet Union and Japan. Mexico: Stalin's political enemy Leon Trotsky dies of severe brain damage as the result of yesterday's assassination attempt by undercover NKVD agent Ramón Mercader. Atlantic: The German armed merchant cruiser WIDDER sinks the British collier ANGLO SAXON 1,000 miles west of Africa. The survivors are machine gunned in their lifeboats but 7 men get away. After 71 days at sea, two of the men are still alive when they reach Eleuthera Island in the Bahamas, 2,500 miles away. ETO - UK: The House of Commons allow the foreign troops of Poland, Norway, Belgium, Holland, France and Czechoslovakia to train in Britain under their own flags. ETO - UK: Day 43 of 114 of the Battle of Britain. Bad weather prevents the Luftwaffe from sending any large formations over England, but they do make some small one-to-two-aircraft raids along the coast. East Africa: Day 73 of 537 of Italy's East African campaign in the lands south of Egypt. CBI - China: Day 1,142 of 2,987 of the 2nd Sino-Japanese War. Day 281 of 381 of the Battle of South Guangxi. Day 2 of 42 of the Hundred Regiments Offensive. Atlantic: The first Arctic convoy leaves Iceland and heads for Russia. ETO - France: French resistance member Pierre "Fabien" Georges commits the first violent act of resistance against the Germans in Paris when he assassinates a German naval cadet in the Barches-Rochechouart Metro station. More than 150 Parisians will be shot by the Germans in reprisal. Russian Front - Finland: Day 54 of 142 of Operation SILVER FOX, a joint German-Finnish campaign to capture the Russian port of Murmansk in the Arctic. Russian Front - Finland: Day 52 of 140 of Operation ARCTIC FOX, a joint German-Finnish campaign against Soviet Northern Front defenses at Salla, Finland. Russian Front - Finland: Day 61 of 164 of the Battle of Hanko. Russian Front: Day 61 of 167 of Germany's Operation BARBAROSSA, the invasion of the USSR. Russian Front - North: Hitler orders his troops not to capture Leningrad by destroying it, but to lay siege as an investment. The Soviets tell their citizens to defend their city to the last man. Russian Front - Center: Day 5 of 23 of the Battle of Dukhovshina, Russia. Russian Front - Center: Day 29 of 38 of the Battle of Gomel, Belarus. Russian Front - South: German Army Group South continues heading toward Stalingrad. Russian Front - South: Day 14 of 70 of the Siege of Odessa, Ukraine. MTO - Libya: Day 134 of 256 of the Siege of Tobruk. East Africa: Day 438 of 537 of Italy's East African campaign in the lands south of Egypt. CBI - China: Day 1,507 of 2,987 of the 2nd Sino-Japanese War. Japanese warplanes sink Chinese gunboats JIANGXI and JIANGKUN at Bazhong, Sichuan Province. ETO - Netherlands: US 8th Air Force B-17s bomb the shipyards at Rotterdam. Russian Front - North: Day 348 of 872 of the Siege of Leningrad. Russian Front - North: Day 109 of 658 of the Siege of the Kholm Pocket. Russian Front - Center: Day 23 of 64 of the 1st Battle of Rzhev-Sychevka, Russia. Russian Front - South: Day 55 of 150 of Germany's CASE BLUE. German Army Group South reaches as far as they will get in the Caucasus. From this point on, they will go backwards. MTO - Greece: US B-24s attack an Axis convoy southwest of Crete, sinking two ships. East Africa: Day 109 of 186 of the Battle of Madagascar. CBI - China: Day 1,872 of 2,987 of the 2nd Sino-Japanese War. Day 99 of 124 of Japan's Zhejiang-Jiangxi Campaign, launched to punish anyone suspected of aiding the Doolittle raiders in China. Roughly 250,000 Chinese will be killed. PTO - Alaska: Day 76 of 435 of the Battle of Kiska, Aleutian Islands. PTO - Malaya: Day 184 of 357 of the Battle of Timor Island. PTO - New Guinea: Day 32 of 119 of the Battle of the Kokoda Track. US 5th and 13th Air Forces provide air support. PTO - Solomon Islands: Day 15 of 187 of the Battle of Guadalcanal. US 5th Army Air Force provides air support. US Marines repel the first major Japanese ground attack. Germany: The I G Farben factory in Oppau, Germany, increases the minimum requirement of work for forced laborers to 67 hours per week. Poland: The authorities at the Birkenau women's camp at Auschwitz Concentration Camp select 498 Jewish women who are considered as unable to work and send them to the gas chamber. 438 of them are Greek. Russian Front - North: Day 713 of 872 of the Siege of Leningrad. Russian Front - North: Day 474 of 658 of the Siege of the Kholm Pocket. Russian Front - Center: Day 48 of 50 of the Battle of Kursk, Russia. Russian Front - Center: Day 5 of 48 of the Battle of Bryansk, Russia. Russian Front - Center: Day 15 of 57 of the 2nd Battle of Smolensk, Russia. Russian Front - South: Day 40 of 48 of the USSR's Lvov-Sandomierz Offensive. MTO - Italy: The Allied Air Forces bomb targets at Cancello Arnone, Villa Literno and Aversa. CBI - China: Day 2,237 of 2,987 of the 2nd Sino-Japanese War. US 14th Air Force attacks the docks and airfield at Hankow. PTO - Alaska: So far during the Aleutian Campaign beginning on 3 Jun 1942, the US 11th Air Force has destroyed 69 enemy planes, sunk 21 ships and damaged 29 others while losing 29 of their own airplanes. PTO - Australia: The Labour Party wins the elections. PTO - New Guinea: Day 122 of 148 of the 2nd Battle of Lae-Salamaua. US 5th and 13th Air Forces provide air support. PTO - Solomon Islands: Day 63 of 67 of the Battle of New Georgia. US 5th and 13th Air Forces provide air support. PTO - Solomon Islands: Day 7 of 56 of the Battle of Vella Lavella. US 5th and 13th Air Forces provide air support. USA: Representatives from the UK, US and USSR meet at Dumbarton Oaks in the US to discuss post-war international security. Atlantic: The HMS ORCHIS hits a mine and is beached off Juno beach, Normandy, France. ETO - UK: Day 70 of 86 of the V-1 "Buzz Bomb" offensive on Britain. ETO - France: Day 28 of 29 of the Breakout Battle of Normandy. Allied Air Forces provide air support. US 3rd Army reaches Reims and Troyes southeast of Paris. ETO - France: Day 21 of 284 of the Battle of Brittany. ETO - France: Day 7 of 32 of Operation DRAGOON, the Allied invasion of southern France. Allied troops continue racing up the Rhone Valley. The French 1st Army surrounds Toulon. Russian Front - North: Day 12 of 28 of the Battle of Tartu in southeastern Estonia. With naval support, the Germans create a coastal corridor 10 to 12 miles wide but Hitler refuses to allow his troops to evacuate the Baltic States. Russian Front - Center: Day 25 of 32 of the Battle of Kaunas, Lithuania. Russian Front: Day 6 of 12 of the German Operation DOPPELKOPF in Lithuania. This was mounted to restore the connection between German Army Groups North and Centre. Russian Front - South: Day 2 of 10 of the Battle of Romania, 2nd Jassy Offensive. The German 6th Army becomes separated from the Romanian 3rd Army on the Black Sea coast. The Germans are ordered to withdraw as the Romanian Army refuses to fight the Soviets and some of the units begin to switch sides. MTO: US 15th Air Force bombs targets in Hungary and Yugoslavia. CBI - Burma: Day 143 of 302 of the Chinese Salween Offensive. US 10th and 14th Air Forces provide air support. CBI - China: Day 2,603 of 2,987 of the 2nd Sino-Japanese War. Day 127 of 259 of Japan's Operation ICHI-GO. PTO - Caroline Islands: US planes hits targets on Yap and Pagan Islands. PTO - Dutch New Guinea: Day 51 of 61 of the Battle of Noemfoor. Although the island has been declared secured, bitter fighting from Japanese continues. PTO - New Guinea: Day 251 of 597 of the Battle of New Britain. US 13th Air Force provides air support. PTO - New Guinea: Day 122 of 481 of the Battle of Western New Guinea. 5th Air Force provides air support. PTO - New Guinea: Day 69 of 80 of the Battle of Lone Tree Hill. PTO - New Guinea: Day 43 of 47 of the Battle of Driniumor River. PTO - Philippines: The USS GUITARRO sinks the Japanese cargo ship UGA MARU off Luzon. PTO - Solomon Islands: Day 295 of 295 of the Battle of the Bougainville Islands. All Japanese resistance comes to an end. 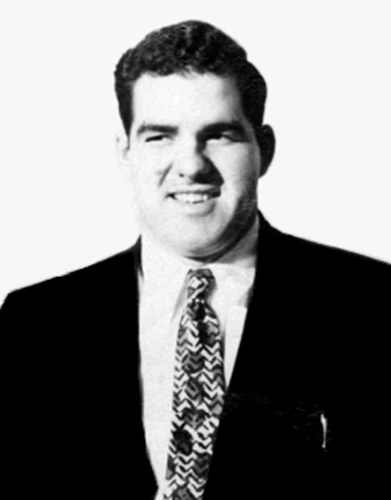 USA: At Los Alamos, New Mexico, American physicist Harry Daghlian Jr of the Manhattan Project accidentally drops a tungsten carbide brick onto a plutonium bomb core and receives a critical dose of radiation, resulting in his death 25 days later. Daghlian was irradiated when he accidentally dropped a tungsten carbide brick onto a 6.2 kg delta phase plutonium bomb core. This core, available at the close of World War II and later nicknamed the "Demon core," will also result in the death of Louis Slotin in 1946 in a similar accident, and was used in the ABLE detonation during the Crossroads series of nuclear weapon testing. As a result of the incident, safety regulations for the project were scrutinized and revised. A special committee was established to review any similar experiments and recommend appropriate safety procedures. These procedures included needing a minimum of two people involved in such an experiment, at least two instruments monitoring neutron intensities, each with audible alerts, and a prepared plan for operating methods and any contingencies which might occur during an experiment. Additionally, discussions and designs for remote-controlled test devices were initiated, which eventually led to the creation of the "Godiva device," an unshielded, pulsed nuclear reactor so named because it was "naked and unshielded." USA: President Truman cancels all contracts under the Lend-Lease Act. China: The first major Japanese surrender ceremony in China takes place at the Zhijiang Airfield in Zhijiang County in the Hunan Province. China: The Oka POW Camp in northern Formosa (Taiwan) is closed. CBI - China: Day 2,968 of 2,987 of the 2nd Sino-Japanese War. Day 13 of 25 of the Soviet Invasion of Manchuria. As the Soviet Army now holds much of Manchuria, the Japanese Kwantung Army formally surrenders to them at Harbin. Their lethal regimes murdered millions and fought a massive, deadly war. Yet their dictatorships took shape within formal constitutional structures and drew the support of the German and Russian people.